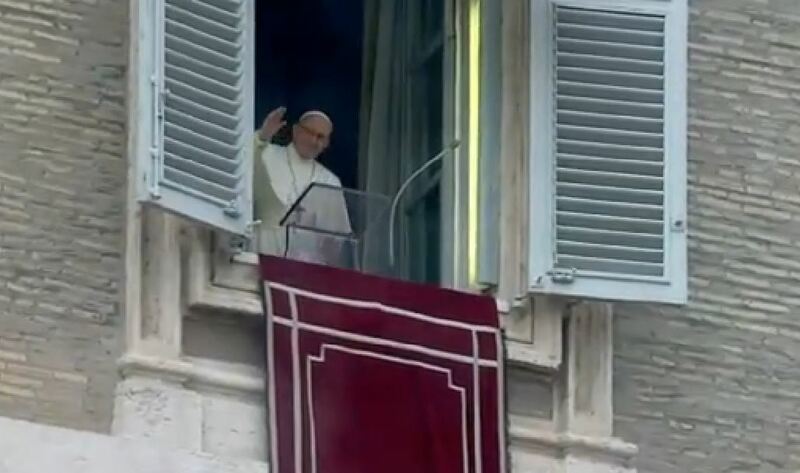 Here is a ZENIT translation of the address Pope Francis gave November 25, 2018, before and after praying the midday Angelus with those gathered in St. Peter’s Square. Dear Brothers and Sisters, good morning! The Solemnity of Jesus Christ King of the Universe, which we celebrate today, is placed at the end of the liturgical year and recalls that the life of creation doesn’t advance by chance but proceeds to a final end: the definitive manifestation of Christ, Lord of history and of the whole of creation. The conclusion of history will be His eternal reign. Today’s evangelical passage (Cf. John 18:33b-37) tells us about this Kingdom, the kingship of Christ, recounting the humiliating situation in which Jesus found Himself after having been arrested in Gethsemane: bound, insulted, accused and led before the authorities of Jerusalem. And then He was presented to the Roman Procurator, as one attempting against the political power, to become King of the Jews. Pilate then carried out his investigation and in a dramatic interrogation, he asks Him twice if He is a king (Cf. vv. 33b.37). And at first, Jesus answers that His Kingdom “is not of this world” (v. 36). Then He affirms: “You say that I am a king” (v. 37). It is evident from all of His life that Jesus has no political ambitions. We recall that after the multiplication of the loaves, the people, enthusiastic because of the miracle, wanted to proclaim Him king, to overturn the Roman power and re-establish the kingdom of Israel. However, for Jesus, the Kingdom was something else, and certainly not brought about by revolt, violence and the force of arms. Therefore, He withdrew to the hill by Himself to pray (Cf. John 6:5-15). Now, answering Pilate, He makes him notice that His disciples have not fought to defend Him. He said: If my kingship were of this world, my servants would fight, that I might not be handed over to the Jews” (v. 36). Jesus wants to make it understood that above political power there is another greater one, which is not obtained with human means. He came on earth to exercise this power, which is love, “bearing witness to the truth (v. 37). It’s about divine truth that in the end is the essential message of the Gospel: “God is love: 1 John 4:8), and He wants to establish in the world His Kingdom of love, justice, and peace. This is the Kingdom of which Jesus is King, and which extends until the end of time. History teaches us that kingdoms founded on the power of arms and lies are fragile and, sooner or later, collapse; but the Kingdom of God is founded on love and is rooted in hearts — the Kingdom of God is rooted in hearts –, conferring on one who receives it peace, freedom, and fullness of life. We all want peace, we all want freedom and we want fullness. And how does it come about? Let the love of God, the Kingdom of God, the love of Jesus take root in your heart and you’ll have peace, you’ll have freedom and you’ll have fullness. May the Virgin Mary help us to welcome Jesus as King of our life and to spread His Kingdom, giving witness to the truth, which is love. Yesterday Ukraine commemorated the anniversary of the Holodomor, terrible famine caused by the Soviet regime that resulted in millions of victims. The image is painful. May the wound of the past be an appeal to all, so that such tragedies never happen again. Let us pray for that beloved country and for the much-desired peace. I greet all of you pilgrims from Italy and from various countries: the families, parish groups and Associations. In particular, I greet the numerous choirs that have come for their Third International Congress in the Vatican, and I thank them for their presence and for the precious service to the liturgy and to evangelization. Thank you so much! I greet the participants in the Congress on Fertility, organized by the Catholic University of the Sacred Heart, on the 50th anniversary of Saint Paul VI’s Encyclical Humanae Vitae, as well as the University students of Jurisprudence of the Roma Tre University. And congratulations because you have been courageous! To come with this rain! You are courageous! Good! And I wish you all a happy Sunday. And please, don’t forget to pray for me.